MICHAEL JON FINK (b.1954): Call, Cold Pastoral, Bells, From the Singing River, First Star, Last Star, Post-Impression, Ruins, Sunless, Nocturne for the Three Times, Softly Yellowed Moon, Triptych, After the End. Description: For some reason, the celesta has received scant attention as a solo instrument. There are a few exceptions; one thinks for instance of Rabinovitch-Barakovsky's Incantations, in which it is cast in a concertante role - and he even got Martha Argerich to play it. Most of the time, though, it is restricted to contributing ethereal, melodious bell sounds in orchestral works. Experimental composer-performer Fink explores the instrument's frankly limited capabilities - mostly the ethereal bells thing - in half an hour of short pieces with evocative titles that chime in simple, tonal chords, intervals and melodies that suggest Alpine church bells echoing in the mountain valleys or contemplative chant melodies. Gentle, lovely, meditative stuff that is probably best enjoyed in homeopathic doses. 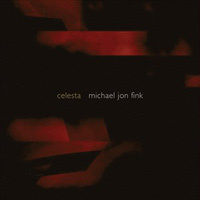 Michael Jon Fink (celesta).